Thank you for visiting the AMS Flight web site. Our goal is to simplify and assure you the order of our airplane or service work and to help you to find the right spare part, your airplane accessory, kit build material or part, flight instrument and other miscellaneous for your needs and help you use them. Ordering our airplane and its options we will send you its Price list with enclosures being used also as order form-s at the same time. Send us your request about. Ordering our services and maintenance works we will send you Service order form. Send us your request with initial definition describing which of our service or maintenance on your airplane or its system you look for. AMS Flight is the actual Carat A Type Certificate holder and the actual LS4 & LS6 series gliders certified composite parts manufacturer. AMS Flight manufactured Apis and Bee series gliders from serial number A014 till the serial number A052. Elan and AMS Flight as certified manufacturers produced all DG-300, all DG-500 series sailplanes & airframes for powered DG-500M / DG-500MB and all DG-100 ELAN series gliders, where their names end with Elan and having “E” serial numbers started from E1 till E219. Many of the assembly parts of these gliders stay us on the stock from that time. The hereby named AMS Flight spare parts came with EASA Form 1 certificate. All airplanes of the AMS Flight support have a maintenance manual. If you do not have one, you can download an actual version from our pages or contact us to send you an issue via e-mail in pdf format. Sending you manual in paper form is payable. The documentation of some maintenance manuals is not sufficient but schematic representations of the controls are mostly available inside, and the many spare parts concern the controls as well. If you need further detailed technical drawings and other plans to define your spare part, contact us to send you an advanced technical issue via e-mail in pdf form free of charge. Sending you drawings and similar technical info in paper form is payable. And many times the simplest way is just to send us an photo image of the desired part you look for with simple added description. In any case this way is help us and you a lot to be faster and complete understandable by first communication already. Important by the spare parts order is that you to define your airplane serial number and its year of production from where we can get additional info to send you right spare part concerning the possible modifications were issued through the sequence via serial numbers of the model of the airplane you look the spare part for. We have also the lists of the most common spare parts of the AMS Flight supported airplanes where you can find also their ID codes to define the spare part exactly. 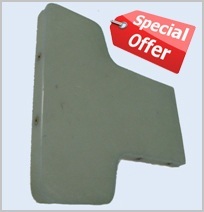 Send us an e-mail to get the Spare parts list for your airplane. Ordering others as instrumentation, accessories, parts, material, miscellaneous and others from our Shop simple to use by the single Item declared ID code to define the correct item in order. 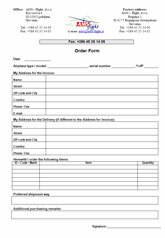 Download our Order form to continue the spare part-s order and send it complete filled to us, by fax or via e-mail what assure us all to avoid potential items misunderstandings. Our world wide located Distributors many times also have a certain amount of spare parts available and this can shorten you the delivery time and to save you the “one item” packing, shipping and handling costs out from the higher quantities centralizing shipments via our distributors. We are adding new shop items and also the Sales prices are defined by. These sales prices stay mostly by all items same and fixed also by your order but AMS Flight reserves the right if necessary to modify the web pages defined prices at the Order confirmation for any case and because of potential time variable reasons: currencies exchange rates jumps, AMS Flight Action sales with discounts, AMS Flight actual Item stock level and AMS Flight ordering method connected to AMS Flight suppliers sales conditions and delivering costs. Our prices are calculated ex factory AMS Flight, Begunje, Slovenia and are not include packing, handling, shipping and export & import duties where these last occur. Please note that we have a minimum sales amount of EUR 25,00 (net part or material Total value on the invoice). If the order amount is less, we reserve us the right to add a handling charge of max. EUR 10,00. The prices Inc. VAT include the presently valid VAT of 20 percent. For buyers addresses within the customer territory of the European Union (EU) the Shop listed and invoiced prices Inc. VAT are including the applicable Slovenian VAT of 20 % if we have not received a valid VAT Id. buyer number in the case of the EU buyer (club, company or other VAT registered EU organization). For buyers addresses outside of the customs territory of the EU the Shop listed and invoiced prices are Excl. VAT, while at the Export of the goods and at the Temporary Import / followed Export of the customs registered service works VAT is not charged or invoiced. After we receive the Purchase or initial Order we send you the Proforma Invoice as AMS Flight Quotation or Order Confirmation with defined delivery term and where the final prices and other costs are of the actual validation. If not any changes result of the confirmation of order, the delivery will be arranged from Begunje factory. By handing over the goods to the forwarding agent (mostly they hold already some shipment insurance guaranty) or to another shipment provider that is charged with the delivery all shipment risks are transferred from AMS Flight to the purchaser. In case the purchaser wishes additional shipment insurance we will take a insurance on purchaser’s cost present it inside Proforma Invoice. Delivery term is part of AMS Flight general announcements and of single Offer; Proforma Invoice and Order confirmation. We generally ship parts using Postal service, recorded (tracking info available) and advanced (Airmail) which is relative inexpensively. It gets the product to the buyer in about 2 – 4 days (Europe) and in about 8 - 12 days (abroad). If the package is too large or too heavy for Postal service shipments standard or if customer prefers faster delivery or higher insurance security we can ship the package using other shipment providers (DPD, UPS, FedEx, DHL, Air Cargo, …) according our proposed shipment way inside the Proforma Invoice or according the agreement with the purchaser giving us his Id. code or other instructions as purchaser opened at chosen shipment provider. Note that UPS, DHL, FedEx and similar courier deliveries require the street address and telephone contact numbers for the delivery, so P.O. Box is not sufficient. Selling our products we look to get bank transfer prepayment based on our issued Proforma Invoice with included final amount Total, with included AMS Flight bank (bank address, BIC – SWIFT) and with included AMS Flight bank account code (IBAN) for the bank payment transfer. Pick up the new airplane, the serviced product, parts and material in Begunje factory you can pay also by cash. Credit card or direct debit (PayPal for instance) payments mean additional percentage cost or for AMS Flight or for you and certain safety and e-mail credit card data sending security risks. In these days it is relative simple to have direct internet access to bank and bank accounts make simple and inexpensive On-line ordering of bank payment transfers. We are adding also Credit card possibility anyway. Contact us for further details and instructions about. All further AMS Flight sales and delivery conditions are defined inside AMS Flight General sales terms and conditions form. AMS Flight offers its products and service with advanced technical support. We look forward to be sure that you are happy with our airplanes, service, parts and support and we strive to help you get the most of them in good shape and manner.